Take a look at the TZADE SOFIT of AL HA'ARETZ. The Yod part of the letter has no Yerech where it connects to the body of the letter. However, the YUD part does have a yerech on the right, just like a normal YOD would. Are you of the opinion that one could possibly be makil on this, as the YOD part does have a YERECH. Or would this be a shinui in the shape of the letter, since there is no Yerech toward the side of the body, How would you consider this? Are there grounds to hold that the letter still retains its shape, and therefore consider it KASHER? Please don't be shy with your comments. It is a nice theoretical question, but in this case just erase the part of the Tzadik and rewrite it. If there is any reason to say it may be passul it is better to err on the side of caution. Since it is the last letter there is no problem of Ksidran. You have hit it on the mark! In this case there is no problem of KeSidran. The question becomes more interesting, however if the tzade sofit had been elsewhere. I think the tzade is pasul as is, since the yud is not connected to the body of the zade but to the head - so it is not connected correctly (see Baruch Sheamar [kovetz sifre stam p. 149-150] in a similar situation). Obvious as Aaron said it can be erased and fixed, being the last letter in the mezuza, the question is exactly how this letter may be fixed, if not totaly erased. Seperating alone, is chok tochot. It matters which part was written first, if the right yud was first then the guf was written b'pisul and it must be erased, if the guf was written first then the yud was written b'pisul and it must be erased. In regard to your question is there place to be meikal etc. this is a lomdus shyla which is a bit delicate - in practical terms it cannot be fixed without mevatel tzurat ha'ot as explained above. Yes, in this case it would not be enough to just mevatel part of the OT. The likelihood is that the YOD part of the TZADE was written first, and then the sofer came in too close to write the NUN part, inadvertently co-joining both segments of the letter. As such both components need to be nullified in order to rewrite the letter. "As such both components need to be nullified in order to rewrite the letter." you probably meant because of the safek, which was written first and which second b'pisul. So here comes another interesting question, whaen there is a safek which was written first, do we have to be machmir and nullify both components? Excellent point. I would assume that in a TZADE SOFIT most people would first write the YOD and then the NUN. Finally, one would come back and attach the YOD part to the body of the letter by extending the Yerech of the YOD. In this case, however, since there is no YERECH attached to the body, it would be enough to just mevatel the NUN part; as most probably this was written last. Yes, it is an extremely interesting question. There is no doubt that it is passul as it is, precisely because it is connected to the head. If it had been connected a bit lower, then we have, as you correctly point out, an extremely delicate question. In my view, I would still call it passul, as because of what I will explain below, it appears to me that the shape of the letter requires that the yerech of the YOD part also be joined to the body. That is, it is not sufficient for the YOD part to just have a yerech. This yerech must also perform the function of linking the YOD to the body of the letter. Support for the above can be derived from the Sefardi letter PEH, which is written like a KHAF with an inverted YOD on it's nose. 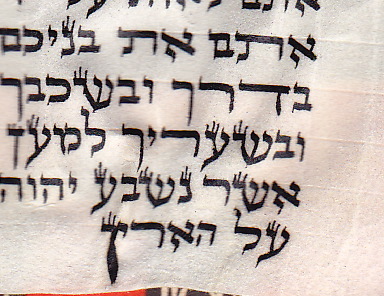 If the YOD were to be stuck to the roof, even though the custom of Sepharadim is to come back with the pen and create a yerech like kutz at the bottom left tip of the nose, the letter would still be passul. From the above, it appears conclusive that just having a YERECH is not enough. In a compound letter, a Yerech must also perform the function of joining to the body to the letter.